I could be really weird sometimes; like those awkward moments when thoughts, letters, words, strings of sentences and paragraphs clamour in a stampede situation to gain entry into my heart, get submerged in passion and powerful emotions and to flow through my right human pen unto some random sheets. I have fought tooth and nail for the last three days to keep away from this thought-on-paper-etching act though one of my most passionate hobbies. Well, it's sort of a perfect day on which to give vent and expression to this that I feel and think. It's exactly my 10th day in National Youth Service Corps (NYSC) Permanent Camp Site, Nsit Atai Local Government Area, Akwa Ibom State, Nigeria. Although I have been more engaged than I ever envisaged and there have been 2,225 corps members, officials of the NYSC scheme, military officers, resource personnel and a number of community people who make up the camp market (popularly called Mami market), I have continued to, bemusedly, exist in a bubble all by myself. I have spoken with people. I have met new friends and persons have walked up to me and offered some kind words and warm compliments but in the midst of all of these, I have been unable to stick my head out; unable to steal a glance at the more or less relational setting that the camp situation indisputably offers. Hold on! Don't be in haste to conclude. I know what you're thinking. Look, I'm not being difficult or asocial and I'm not confused either. I have just been stunned for 10 whole days. I have been awestruck and I have been so buried in my own thoughts; the firm effect of all I have observed within the past 10 days. The NYSC is a national scheme; fair enough. For me, the word "National" really finds full expression in the NYSC scheme. It is where North, East, West, South and the Central meet and stay together within the confines of a camp ground somewhere in a country called Nigeria, the Giant of Africa. The same is the case in the 36 states of the federation including Akwa Ibom state; the space within which I sit right now and from which I look and paint with the eyes of my mind. Youths from all walks of life get to live together within the NYSC orientation camp for a period of three weeks. The Hausa youth gets to do a dance performance with the Ignorance youth who is generally believed to be a die-hard enemy. The Igbo youth sleeps right in the same hostel as the Urhobo youth. The Ibibio youth gets engaged in drama rehearsals with the Yoruba youth where the Benin youth acts as paramount ruler and the Igala youth as the oracle. They all get turns to cook together and also eat from the same pot. Security is a communal affair. Skill Acquisition and Entrepreneurial Development (SAED) is not conditioned by religion, personal belief or tribe. When the Itsekiri lady who happens to be an asthma patient falls into crisis right there on the parade ground due to the rise of dust from banging feet, the Ijaw youth is the first to rush to rescue her. All others rush in and a life is saved. They take her to the camp clinic because she has lost energy even though her breathing has become quite stable. It no surprise that the doctor who attends to her immediately is an Ogoni youth. When drugs need to be administered and she has run out of cash to buy some food, the Tiv youth brings her something to eat even when he is low on cash and they all wait patiently until she fully recovers. When they achieve a collective victory or achieve a great feat, they emit great joy as an indivisible team. The national anthem is sung, the national flag is raised and together with the nation's flag, we all come alive. Founded on my observation, I am about to air my view and to make some solid statements. I am not in a bid to convince or persuade you to agree with me; I usually do not have time for such. Rather, I am categorically stating that Nigeria has what it takes to be one nation. Nigeria has the raw potential to be a united, peaceful and progressive nation. Hearts still pure, unpolluted (maybe smeared a little bit with hate, tribalism and nepotism but not totally irredeemable) and warm. Strong youths; the future of the nation and the pride of the black skin. Nigeria may, most times, seem like a really big joke but this nation has a tomorrow that can be achieved. The NYSC scheme, I strongly recommend should be sustained and revitalized. 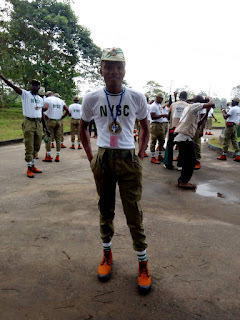 As a matter of fact, for me, the NYSC orientation camp is a closed shell; a different world of its own; entirely out of the usual Nigeria; the usual outside world that we all know; the world I hope we all get to forget before the expiration of our time here in this camp. As a young Nigerian scholar, I consider the camp as a microcosm of the larger Nigerian nation and irrespective of what Nigeria seems to represent at the moment, I choose to identify with the camp-microcosmic perspective. Nevertheless, I'm inclined to assert that there is a beast, a demon, an evil alien creature, whatever...that is unflinching in its mauling of our national conscience outside the walls of this camp. There is an unseen power of sorcery and intellectual derangement that has stolen away the collective Nigerian identity, making the average Nigerian a wanderer tossed to and fro the desert in search of an ocean, maybe a hopeless soul lost at sea without the shore in sight and who, most saddening, does not even know that he is without hope. We are a piece of fabric meant to be wholly tailored into a fine robe in the eyes of the world but the demon has crawled in and each man suddenly longs to tear off his own piece of this fabric and it ends up a pack of shreads. We are a singular diversity, so beautifully crafted and endowed with the blessings of the Almighty. The Nigerian nation is one entity that must stand together to defeat the beast; to triumph over the demon; to break free from the shackles of the alien. I fear for the thousands of corps members who will walk back into the outside (sadly familiar) world in a couple of days all over Nigeria. I fear for what becomes of the identity they seem to have taken up sooner than one many have expected. I fear for the identity crisis and values confusion they may face when the gates of this camp give way. Let young people choose the direction in which to steer the ship of the Nigerian state for their sake and for that of the unborn generations who have only lent us this land for a while. Young people must decide. Sooner or later, the old will fill up the graves and we will be left alone in the face of the Nigeria we have refused to push towards the frontiers of unity, peace, progress and positive impact. The old are fast fading away. Let us decide. Nigeria, of course, can get better. It is only a matter of choice. The world is a really large place. It is better to stay together than to stay alone. I tell people all the time that the change Nigeria needs has to start from us. I've never seen a beautifully painted picture of Nigeria but hey!here's one. It gives me a certain feeling of hope,that there can be a better Nigeria,a beautiful Nigeria devoid of hate and stereotyping.